Described as ‘Shaun of the Dead meets La La Land’ (First Showing) this is a brilliantly bonkers, Bafta-nominated zom-com musical, from the creator of the internet smash Ryan Gosling Won’t Eat His Cereal. 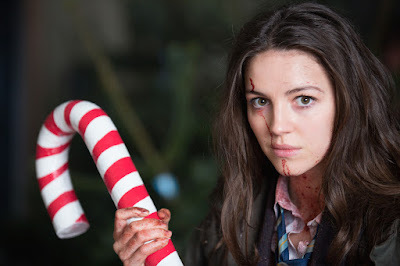 When a zombie apocalypse threatens the sleepy town of Little Haven, Anna and her friends must fight, slash and sing their way to survival, facing hellish snowmen, an undead Santa and bloodthirsty elves in a desperate race to reach their loved ones hiding out at their local high school. Ryan McHenry, the brains behind the internet Vine smash hit ‘Ryan Gosling won’t eat his cereal’, won a Bafta for his 2010 short Zombie Musical - but sadly, didn’t get to see it turned into a full-length feature film. After McHenry died in 2015, his friends, including co-writer Alan McDonald, took up the mantle to honour his vision. The result is Glee soaked in gore, as a school is under siege from zombie hordes, in an unstoppable, smile-inducing hour and half of song, dance, blood, guts and chuckles, with some cheeky nods towards Justin Bieber and (naturally) Ryan Gosling along the way. Energetically directed by John McPhail (Where Do We Go From Here? ), stylishly shot, and featuring terrific performances from a young cast of future stars, ANNA AND THE APOCALYPSE is a wonderfully quirky homegrown horror brimming with invention and heart, that Nerdist says is ‘extraordinarily entertaining’. Ella Hunt (soon to be seen in the TV series Dickinson) is just wonderful as the titular Anna, and the film also features hugely enjoyable turns from familiar comedy faces Mark Benton (Eddie The Eagle) as Anna’s dad and the school janitor, and the legendary Paul Kaye (Game of Thrones) as the school principal. ANNA AND THE APOCALYPSE is singalong zom-com that crosses High School Musical with Dawn of the Dead and comes up smiling. Vertigo Releasing will release ANNA AND THE APOCALYPSE on Digital HD on 22nd March and on DVD 8th April 2019.